The next adventure for discussion is “The Three Garridebs” First published in Collier’s in October 1924 and in The Strand in January 1925. (The case itself was set in 1902). Dr. Watson begins recording this case with “It may have been a comedy, or it may have been a tragedy.” How would you class it? Watson prompts us to judge for ourselves. We learn that Sherlock Holmes refused a Knighthood. What was it for? Why did he refuse? Others have questioned if he would have accepted had it been Queen Victoria who offered it? (The Queen passed away in 1901). We also learn that there was a telephone in the room at 221b. We have now reached the 20th century! 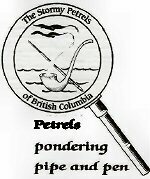 The Stormy Petrels will have much to discuss at their April meeting. What about the gun play? Do you think Holmes had it in him to actually pull the trigger? Bonus question: Does the plot sound familiar? John Garrideb was familiar with Watson’s accounts of the cases. Name one of the two adventures that this case sounds like.